Out of all the options for dress-up days at school, School Spirit Day seems like an easy one to pull off. Not when you have a child who primarily dresses in one color… pink. I can’t even think of a school that uses pink for one of its colors. 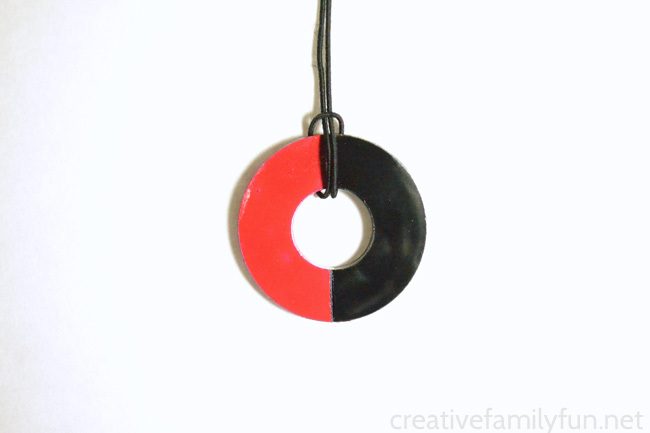 Our current school’s colors are red and black. They’re popular colors… just not pink. So, the last time we had School Spirit Day, I got out the craft supplies instead of making an emergency trip to the store for new clothes. 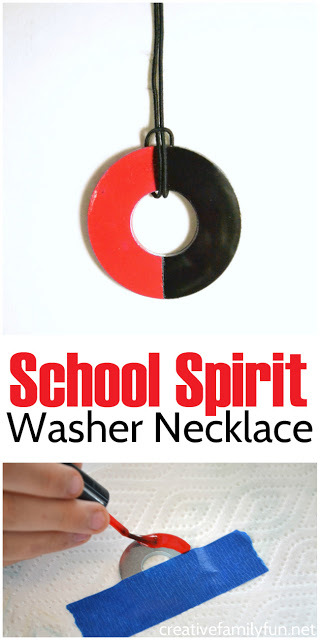 Now, we have an awesome School Spirit Washer Necklace to wear. Note: We went to our local hardware store for the washers. They often sell them in bins and you can buy them one at a time. Pick out the size you prefer. Luckily it doesn’t take any special kind of paint to decorate a metal washer. Regular nail polish covers it beautifully. It stays on and doesn’t chip. You don’t need to buy gel polish or even expensive polish. Just get a couple of bottles of the inexpensive stuff. And, as a bonus, you’ll be able to paint your nails for School Spirit Day too! Before beginning, lay down a paper towel to protect your work surface. 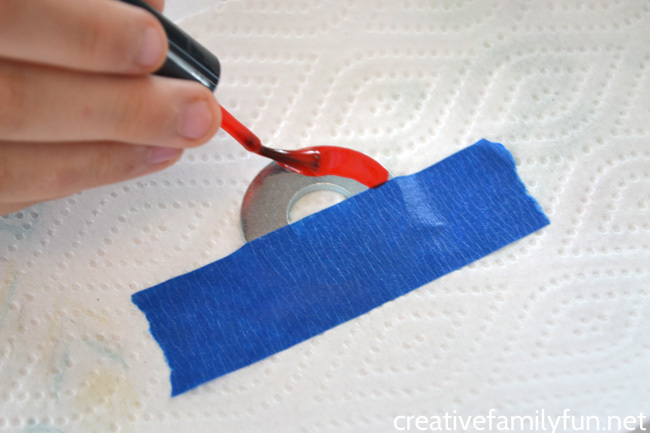 Put your washer down on your paper towel and cover half of it with painter’s tape. Use your lightest color of nail polish and paint one half of the washer. We found that we only needed one coat of the nail polish. Let the nail polish dry for a minute or two and then carefully remove the painter’s tape. Next, carefully cover your painted half with painter’s tape. You want to make sure your painted half is completely dry before covering it in painter’s tape so you don’t smudge the nail polish. Let dry for one or two minutes, then carefully remove the painter’s tape. Let your washer dry fully and then flip it over and paint the other side if you desire. 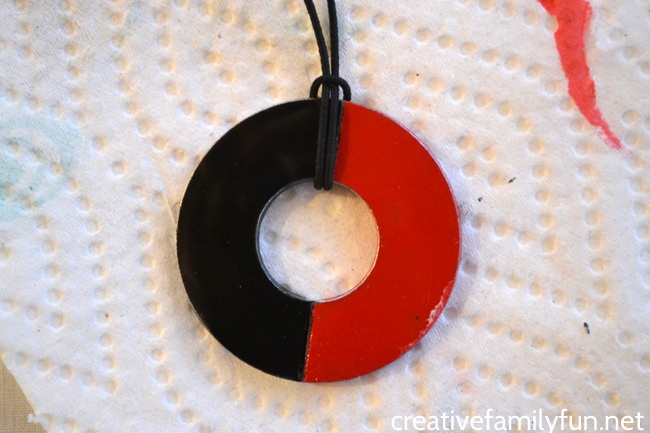 Once your school spirit washer necklace is completely dry, you can add the cord. Take a length of cord about 28-inches to 30-inches. You’ll want to be able to just slip your necklace over your head. Adjust the length so that it’s not too long. Lay your tied cord down on a table so that it’s in one narrow strip. 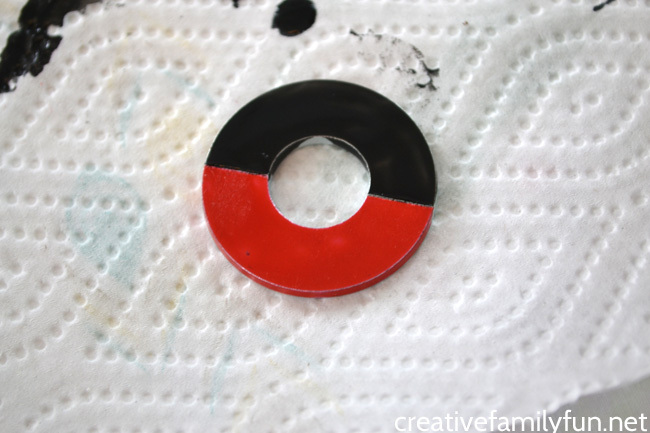 Place your painted washer on top and pull the looped end through the middle of the washer. String your knotted end through the loop and pull all the way up to secure your washer on the end of the cording. Your necklace is all ready to wear! My girls had so much fun wearing their necklaces on School Spirit Day along with their matching nails – of course. Now, it didn’t matter what color our clothes were. 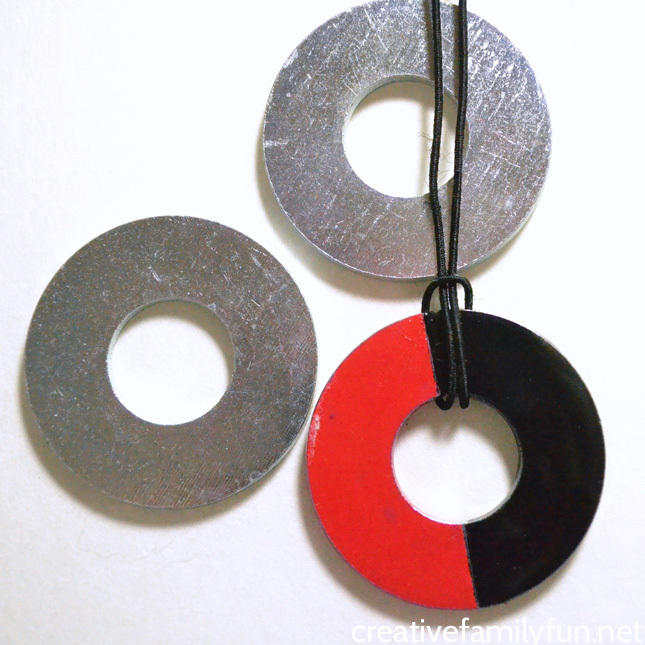 This school spirit washer necklace is so easy to make and kids can do it themselves. And, while you’re at it, make a couple of extra. They’d be a fun gift for a best friend!